Life & Times of YzzyBella | Commentary of a Twenty Something Attempting to Lose Weight & Live Life. Formerly AspiringSkinnyMinnie. Hope you’re all well. Sorry that I have been mostly AWOL. Work has been relentless the past couple of months and has no signs of letting up BUT I have been on plan every single day. This is going to be quite a lengthy post so grab a brew and a snack! I had a dietician appointment at the beginning of the month. I left the appointment feeling very conflicted. On one note, the dietician was happy that after three appointments and 9 months, I had finally started to shift some weight. 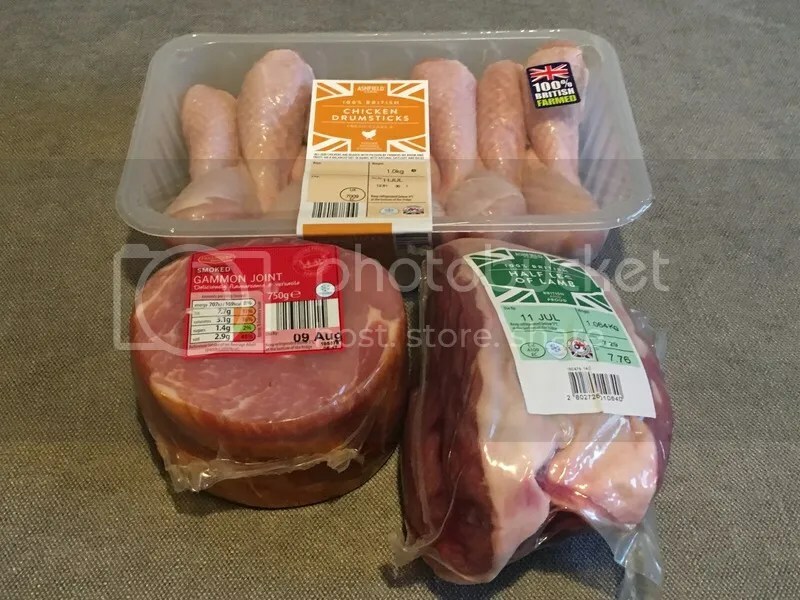 However, when she asked me what I had changed and I mentioned that I had gone low carb, she seemed particularly concerned, especially when I said I was aiming for around 80-90g a day. Even more so when she asked what my sources of carbs were and I replied mainly fruits and vegetables. According to her, they don’t count as having carbohydrates and I should have 30g per meal of starchier items such as bread, pasta, rice, etc as well as 10g carbs worth of fruit and 10g carbs worth of dairy. PER DAY. I did mention that my bloods were really good and my blood pressure had gotten so much better that I could cut back on a tablet but she gave me a good telling off. I admit I felt really confused. I had done my research beforehand from various sources including the diabetes.co.uk website and the advice she was giving me conflicted all of this. On consulting the diabetes.co.uk forum, it turns out that a number of people have experienced the same thing. On talking to my family, I have decided to see how it goes as I am now and if I begin experiencing any bad side effects, I can always introduce more carbs into my diet. I am including one or two sources of starchier carbs in my diet a week – for example, a small portion of potatoes or a slice or two (depending on how I’ve eaten!) of the Weightwatchers malted bread as I LOVE avocado toast! Despite the ups and downs of the dietician appointment, she did manage to get the nurse to fit me in for a HBA1C test and my result was really good! This time last year, I was at 98. I have managed to get it down to 43 – even the nurse congratulated me as she gave my result to me. So, in 8 weeks, my total weight loss stands at 9.5kg or 1.5 stone. The last month I’ve lost 9lbs so around 2-2.5lbs a week which is at a nice safe rate according to the NHS. 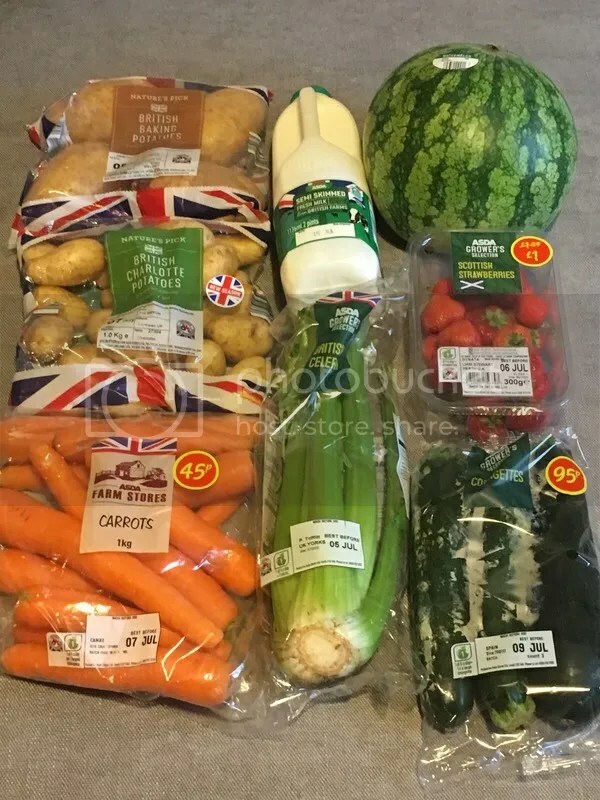 I had started a couple of DietBets last month to boost my motivation and as my final weigh ins are this week, I think I’ll be happy with a bit of extra pocket money too! I’ve also been regularly swimming three times a week and walking to work and back at least once a week. My feet no longer hurt walking 2-3 miles and being on my feet at work so it’s a massive bonus! However, one thing I have not enjoyed one bit (and if it’s too TMI, don’t scroll down any more!) is that my periods have come back with a vengeance. I have had the implant in since 2009 (replaced every 3 years) and haven’t really had one since then. I’ve had spotting every now and then but that’s about it. The beginning of September started with one of the heaviest and crampiest periods I have ever had and turns out my cycle has decided to become regular straight away. Damn. I’m not sure if my implant has run out early (as it has around 6 months before my scheduled removal date the last two times) or if the weight loss has kick started my cycles. Either way, it’s the one thing that’s very much not welcome! My doctor said I have to see if they become really regular before they will consider changing the implant early as this time round it’s only two years in so I guess I’ll have to put up with it until then! So I am writing this a little late – mainly because I was mainly eating on my own (as OH didn’t fancy ANY of the food I had planned!) and I got treated to a couple of meals for doing some extra bits and pieces for people. 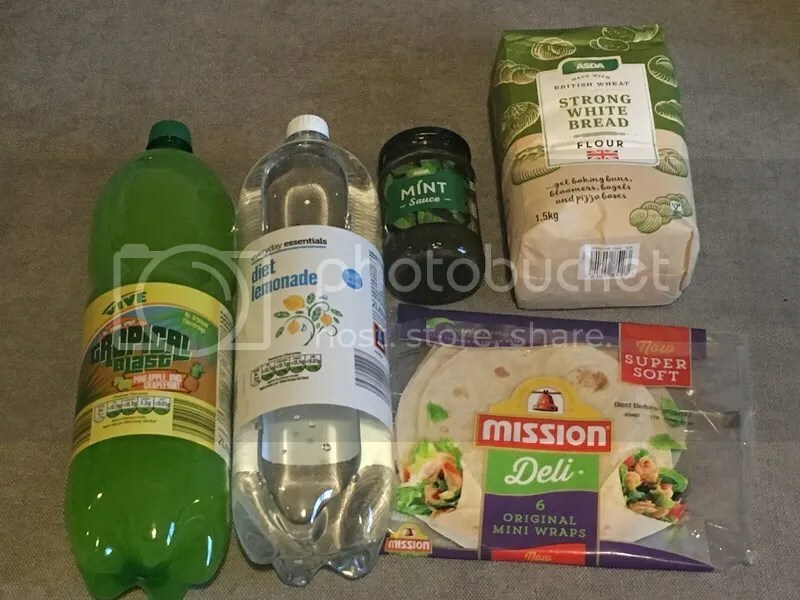 My £25 food budget ended up lasting me two weeks and I topped up during this week (10-16 July) with some impromptu snack foods as I was working super late one night and had run out of food and a trip to McDonalds >.< so I've probably spent around £50 over the two weeks. I did the majority of my food prep in one day whilst I was doing some paperwork at home. I did have a couple of cravings for certain foods which I made using stuff I already had so I didn't buy any additional ingredients (10/10 for sticking to the budget for me!). So first off I cooked my gammon joint from Aldi. I used this recipe from Feisty Tapas and then made a delicious gammon and vegetable soup based on Feisty Tapas’ recipe here. I added a few more veggies to clear out what I had left in the fridge and to bulk it out a little more as well as adding a cinnamon stick, star anise and Sichuan peppercorns for extra flavour. 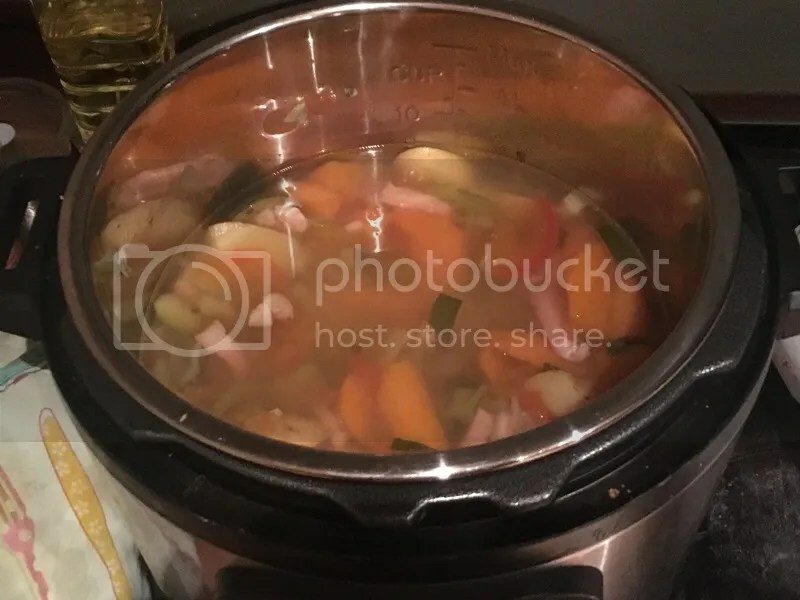 I really do recommend this recipe – it’s so delicious and I love using my new Instant Pot. I used about a third of the gammon joint to slice back up and put in the soup and I sliced the rest to use for another meal. 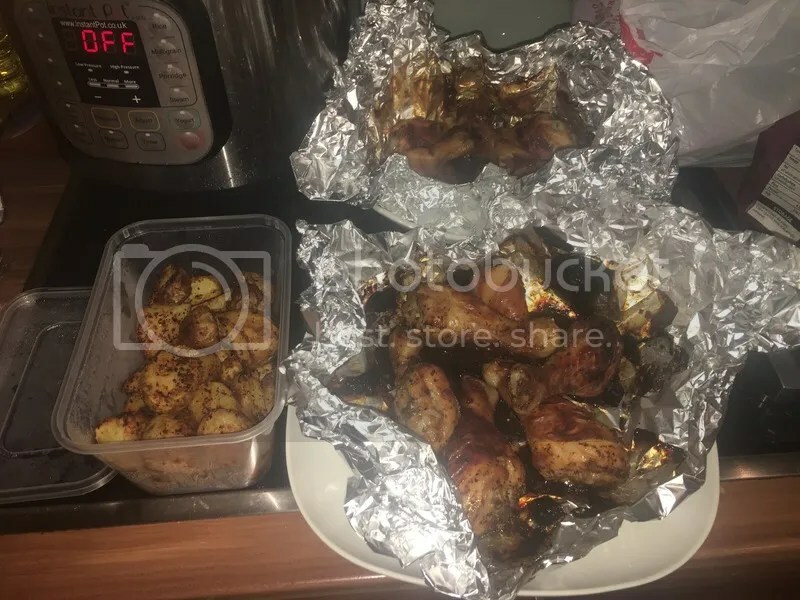 The night before I marinated my chicken drumsticks. 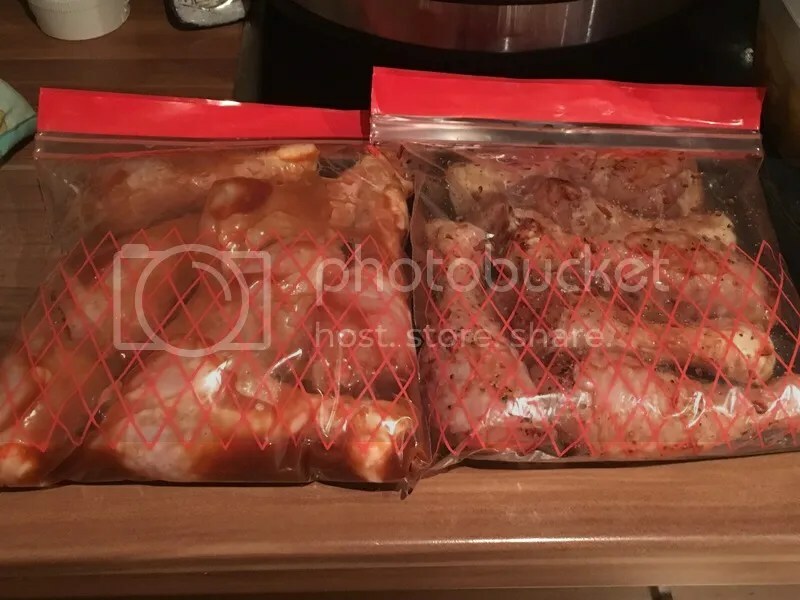 I marinated half in a BBQ sauce I had lying around and the other half I did my own marinade of soy sauce, fish sauce, honey, pepper, chilli, garlic powder and some smoked paprika. I then roasted these and took the meat off the bone for meals, sandwiches or salads in the week. At the same time I roasted some new potatoes and carrots to go alongside some meals. 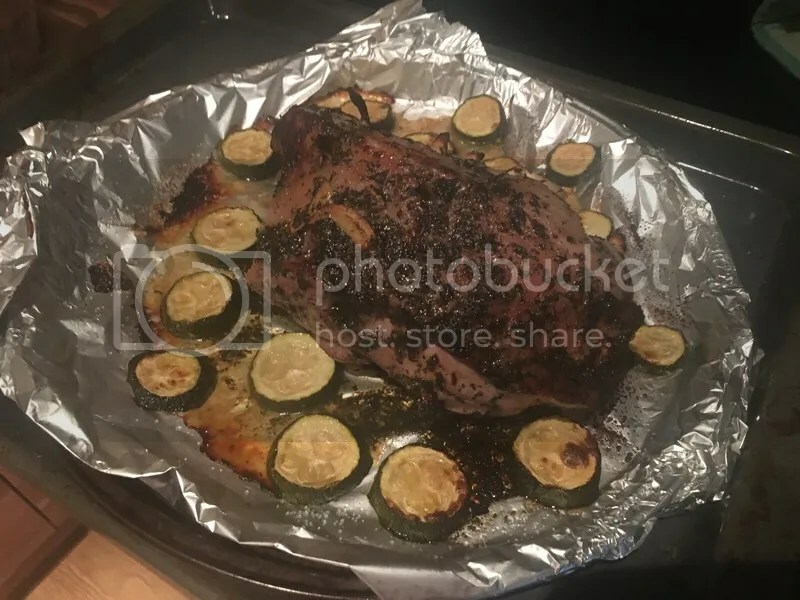 Whilst the oven was still on, I also roasted my lamb leg with some courgette slices. I put garlic pieces in little slits all over the lamb leg and then covered with salt, pepper and mint sauce. 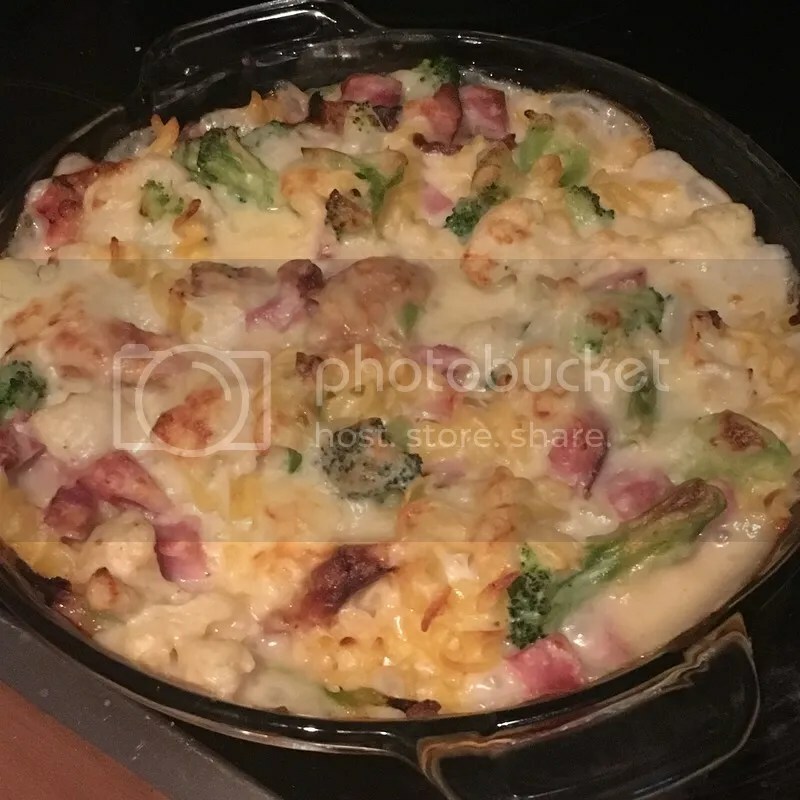 Midway through the week I had a craving for a creamy pasta bake. I made a cheese sauce from scratch using a bechamel base (flour, butter, milk). I used some water in place of some of the milk to reduce the calories a little bit. 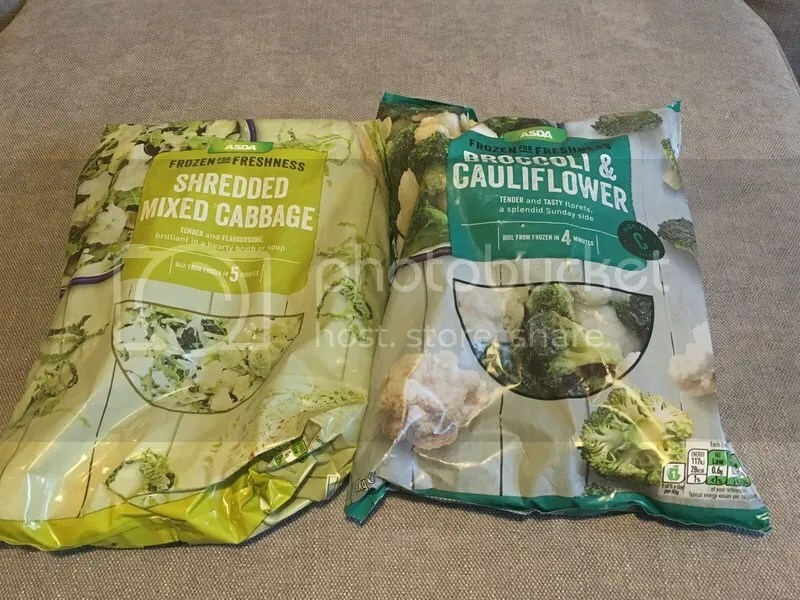 I threw in some of the chicken, a slice of gammon as well as broccoli and cauliflower and some pasta we had in the cupboard. Placed it in the oven for around 20-30 minutes until golden brown and served it with homemade garlic bread. I had made a homemade loaf but forgot to take a photo! 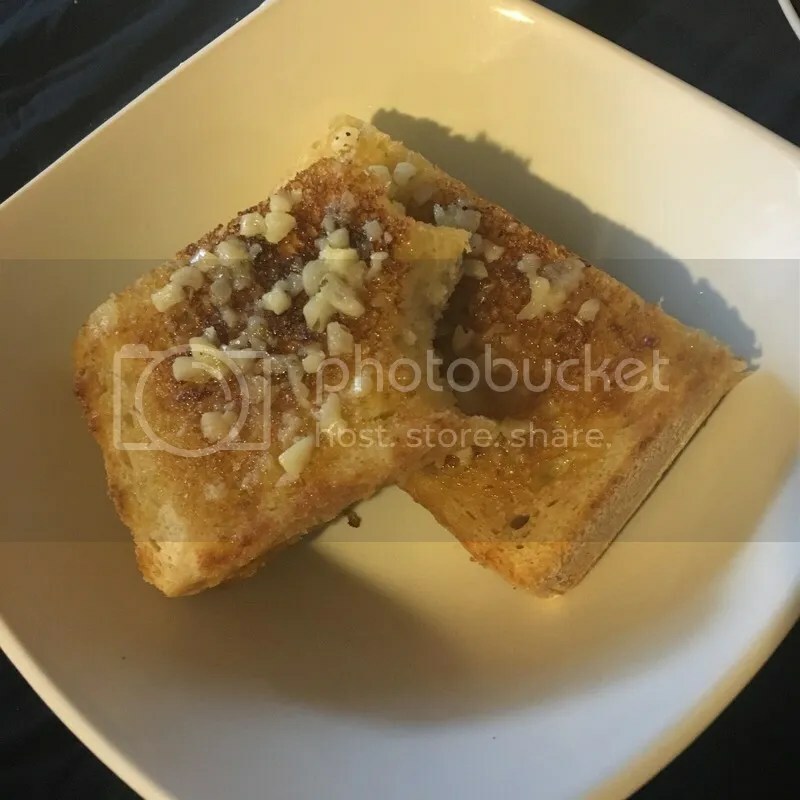 To make the garlic bread, I toasted it before putting a mix of butter, garlic powder and chopped garlic and placing it in the oven for the last 5 minutes. I also had a super craving for congee late one night after work which I also forgot to take a photo of as it was so late and I was a little hangry. I based my recipe on this one from Pressure Cook Recipes. As I used the chicken I cooked earlier, I reduced the cooking time a little to just cook the rice through. I added preserved Tianjin vegetables and some pieces of spam I had sliced in the freezer from the last time we had hotpot. Really delicious. As of today, I still have some leftover pieces of lamb and gammon and some frozen veggies and potatoes. My next post will be on some of the meals I’ve eaten over the last couple of weeks.